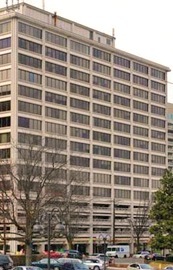 Taking the Metro: Our office is located 1 1/2 blocks north , on the left hand side of the street, from the Red Line Metro Station at Friendship Heights. Our office is across the street from the main Saks Fifth Avenue department store, next door to the Court Yard Marriott and next to the Somerset Apartments. Our office is on WisconsinAvenue in Chevy Chase. The building is 2 blocks north of Western Avenue (the District Line) on the left hand side of the street. It is a 10 -20 minute drive from downtown. For those coming from the North, our building is about 10 - 20 minutes from the beltway. Take exit 34 of 495 and go south through Bethesda and we are the first office building on your right when you enter the center of Chevy Chase. Coming from Virginia you can take the Key Bridge to Wisconsin Avenue and proceed north. Or you can go around the Beltway 495 and take the River Road exit. Then travel south to Willard Avenue and turn left. Two blocks latter you would then turn left onto Wisconsin Avenue. Parking is available in our building's parkinggarage, across the street at the Saks Fifth Avenues lot or on thestreet (2 hour parking).